The name "Antimatter Catalyzed Micro Fission/Fusion" for this drive concept is a bit of a misnomer. Obviously, the antimatter is not actually a catalyst, but rather provides the energy necessary to achieve the desired nuclear reaction. In the following section, the ideas behind the ACMF drive will be discussed, followed by a brief overview of the ICAN-II spacecraft that is being designed to use this drive concept. As mentioned in the overview of Antimatter Drives, the world's production of antimatter is abysmally low. Currently it is on the order of 1 to 10 nanograms per year. While antimatter has a tremendous energy density, this is still completely insufficient for a pure antimatter/matter reactor drive. That rules out manned interstellar travel using antimatter drives in the near future. However, a hybrid between antimatter and nuclear drives would allow humans to explore their own solar system with reasonable mission times and costs. One of the two hybrid designs is the ACMF. The ACMF concept is being developed at Penn State University and is based on their findings that antimatter can induce a more efficient fission reaction than normal fission methods. For those that are unaware, fission is the nuclear process in which a heavy atom (such as plutonium) splits into two lighter atoms, thereby releasing energy. On the other end of the scale is fusion, whereby two light atoms (such as deuterium and tritium, both hydrogen isotopes) fuse together to form a heavier atom, this also releases energy. Fusion can continue to release energy up to the point of Iron, similarly fission can release energy down to the point of Iron. Iron is the minimum bonding energy atom. A pellet of Deuterium, Tritium, and Uranium-238 (nine parts D-T for every one part U-238) is injected into the reaction chamber. First the pellet is compressed using ion particle beams , then irradiated with a 2ns burst of antiprotons . The antiprotons annihilate some of the pellet, producing enough energy to cause the U-238 to fission . In turn, the fission reaction ignites a fusion reaction within the Deuterium-Tritium (D-T) core . The fusion reaction produces the desired engine thrust. A new pellet is than inserted, and the process repeats itself. This drive concept seems to be the most efficient (as determined by NASA) for use in manned, planetary missions. A round-trip, manned mission to Mars using the ACMF drive would only take 120 days, and require approximately 140 nanograms of antimatter (which could be produced in one year by Fermilab after a few major upgrades are implemented). In addition, it would require approximately 362 metric tons of propellant (the D-T-U pellets). Picture obtained from LEPS site. 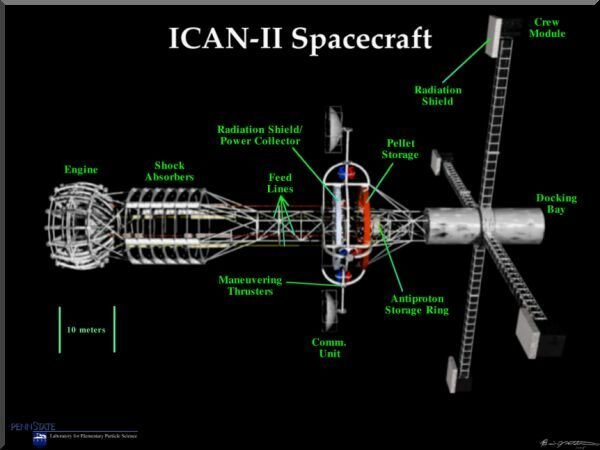 ICAN-II is similar to the ORION spacecraft design put forth by Stanislaw Ulam in the late 1950s. The ORION was intended to be used to send humans to Mars and Venus by 1968. It was to utilize a large number of nuclear bombs that would be set off one after the other, behind the ship to push it forward. It would, of course, require large shock-absorbers and ablative shielding for its pusher-plate. The ICAN-II also, in a sense, utilizes nuclear "bombs" for thrust. 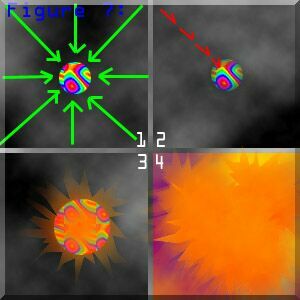 However, instead of regular fission bombs like the ORION would utilize; ICAN-II uses what are, essentially, a large number of very small hydrogen-bombs. Set off, of course, by a stream of antiprotons. Ecological concerns would probably require that ICAN-II be assembled in space. Of course, a precedent for such large scale orbit-based assembly is already being set by the construction of the International Space Station. 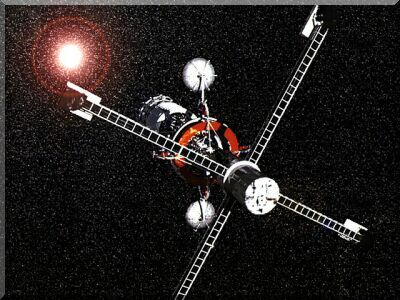 The ICAN-II is a viable spacecraft design that could be built within the next two decades. Currently, antiprotons can only be stored for a few weeks and production is very low; but, the problems with the storage and production are engineering problems, not physical problems. Humankind has shown, thus far, that any feats of engineering not expressly forbidden by the laws of physics, will be achieved.